Carrots are among the most universally grown, if not the best loved of vegetables. Because of their broad appeal — radiant colors, diverse shapes and sizes, culinary versatility, and nutritional value — demand for carrots will always be strong. Horticulturally, though, they can be particular, and even seasoned growers find them exacting in their requirements. Because demand is reliably strong, however, mastering carrot culture can be well worth a grower's while. Johnny's carrot experts have developed this guide in response to the frequent requests for carrot-growing advice we receive. Begin here with the four keys: Bed Preparation, Spacing, Weeding, and Watering. If you get these right, you will be off to a solid start. ✓ Light, loose, friable and loamy soil vs. heavy clay, compacted or stony soil. ✓ Free of debris, for the most part. ✓ As weed-free as possible — a few initial weedings are beneficial, including flame-weeding just before seeding or just before carrot seeds germinate (see below). ✓ Slightly acidic soil, pH 6.0–6.8 (a range favorable to growing many other vegetables as well). Carrots like consistency: They grow best with no wide swings in temperature or moisture. They grow straightest and smoothest in deep, loose, fertile sandy loams and peat soils, with good water-retention capacity to keep moisture levels even. To the extent a grower can influence the environment, these favorable conditions are most effectively achieved through correct bed preparation and spacing, and timely weeding and watering. Deeply-worked soil minimizes the resistance encountered by the growing carrot roots as they elongate. Resistance can lead to misshapen roots. While interesting to look at, forked, stunted, or twisted carrots are more prone to damage during harvest; are less easily handled, transported, and stored post harvest; and generally don't sell as well as smooth, evenly proportioned carrots. 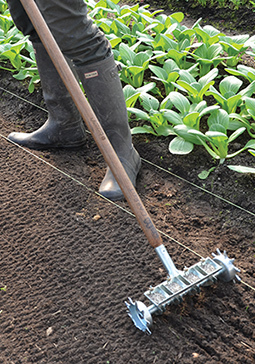 For information on effective tools for carrot bed preparation, see our Guide to Small-Scale Bed Preparation Tools and Eliot Coleman's 6-Step Bed Preparation Method. Allow for at least 12" between rows; 18" is ideal. Spacing also depends upon the variety grown and its top height. Smaller-rooted or smaller-top varieties, such as Atlas (Parisian Market type), Caracas, or Adelaide, can be packed in a little more closely than some of the larger Nantes and Imperator types. Spacing needs are also dictated by the width of the cultivation equipment being used. • Carrot seeds are small, and their size varies from variety to variety as well as from lot to lot — even if two lots are from the same harvest. Carrot seeds are also elongated in shape, and ridged with spines. These physical characteristics make carrot seeds difficult to singulate when seeding by hand or with seeding equipment. • In addition, carrot plantings usually require thinning when seeded with raw seed, which can be very labor intensive. • Many of our carrot varieties are available in pelleted versions that meet organic certification requirements. • Precision pellets provide for a less labor-intensive, easier way to singulate carrot seed. Pelleting renders the seed more uniform in shape, weight, and size, allowing seeds to be planted with precision at correct distances and depths. Less seed goes to waste, and less labor is required to thin the plantings. To learn more, see our Tech Sheet About Pelleted Seed. Or browse our Pelleted Carrot Seed. 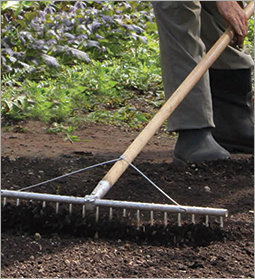 A range of methods and tools can be used to weed and cultivate your carrot beds; flame-weeding, cultivator tractor attachments, wheel-hoes, and various long- and short-handled weeders and cultivators all have their effective applications. Before planting your carrots, weeding or tilling in the weeds several times is ideal. We also recommend flame-weeding just before seeding, or just before the carrot seeds germinate. One of the most successful pre-emergence timing strategies, particularly for organic growers, involves placing a sheet of Plexiglass over the first few feet of a seeding, then checking it daily. As soon as you notice the carrots begin to germinate beneath the Plexiglass, it's time to flame weed, because the rest of the stand will begin emerging in 2–3 days. If precision pelleted seeds are not used and thinning is thus required, the first post-emergence weeding should be carried out as soon as the carrot cotyledons emerge from the soil. This gives the seedlings the upper hand because their growth will be ahead of any ensuing weeds'. The second post-emergence weeding/cultivation should take place when the seedlings reach roughly 3–4" in height. The third post-emergence weeding/cultivation should occur when the seedlings are 5–6" in height. And, finally, a fourth time is recommended when the seedlings reach 7–8" in height. For more information, read Small-Scale Weeding & Cultivation Tools for Greater Efficiency. The development of a healthy carrot crop requires moisture in sufficient quantities at the correct times throughout the growth cycle: not too dry, not too wet. Here are the specifics. In the beginning, from sowing to emergence of the cotyledons, low volumes of water should be supplied frequently. Keep in mind that if the soil dries up and a crust forms, seedlings will have a difficult time emerging, and stands will be compromised. To reduce germination issues if a crust does form, your next best step is to make sure the soil surface stays moist, to help mitigate the effect of the crust. As the carrot tops begin to develop more leaves, adequate soil moisture should be maintained, but with less frequency and less volume than during the first growth stages mentioned previously. By this time the small plants are established, and the reduction in frequency and volume induces the roots to grow longer. Towards the end of the lifecycle as roots are increasing in size, watering should be less frequent but with greater volume. • Choose shorter, smaller carrot types that mature relatively quickly, such as the Parisian Market variety Atlas. • Among Early Carrot Varieties, longer–rooted varieties with fewer days-to-maturity include YaYa and Napoli. • Heat can cause carrot flavor to be bitter, so plant as early as possible to beat the heat. Drought stress during the first few weeks of carrot plant development can be very detrimental, as is the case with many crops. Germination rates can be reduced and the plants will not get off to a healthy start. Drought stress during carrot root development can often lead to underdeveloped roots that take longer to mature. For small, rounded, Paris Market-type carrots such as Atlas, insufficient soil moisture will lead to elongated roots by forcing the roots to "reach" for available moisture deeper in the ground. Too much soil moisture can likewise have a negative impact. Excessive watering can lead to forked roots, especially when this occurs during the first few weeks after seeding. Excessive soil moisture from over-irrigating or heavy rainfall will often cause growth cracks in carrots. Wide fluctuations, too, in moisture can cause cracking. Excessive moisture in the soil and/or on leaves can also create environmental conditions conducive to certain diseases. Depending on your location and experience level, providing optimal growing conditions for your carrots can be more difficult to achieve than it is for other roots and tubers, such as potatoes or onions. Like these other vegetable standards, however, there is a steady, year-round demand for carrots. When provided their basic cultural requirements — a properly prepared growing bed, appropriate spacing, and timely weeding and watering — carrots will reward the extra time and attention they are given with their flavor, versatility, and marketability. We encourage you to use the guidelines here to establish generally favorable conditions, then optimize to grow the finest carrots possible in your region.